Did the sauropod Leinkupal survive the End Cretaceous mass extinction? Many animals have skeletons besides dinosaurs. I was reminded of an old post on this blog today when someone brought up the all too common question of “Is that real?” in museums. In 2011 I had visited the Smithsonian natural history museum for some of my Euoplocephalus research, and spent a day browsing the galleries and shamelessly eavesdropping on people’s conversations. I was dismayed by the number of people saying things like “What’s that!” and then walking away without finding out, or saying “Look, a T. rex!” to things that were patently not T. rex. In the comments on that post, there was some discussion of the fact that visitors to museums often mistake any skeleton as a dinosaur skeleton. 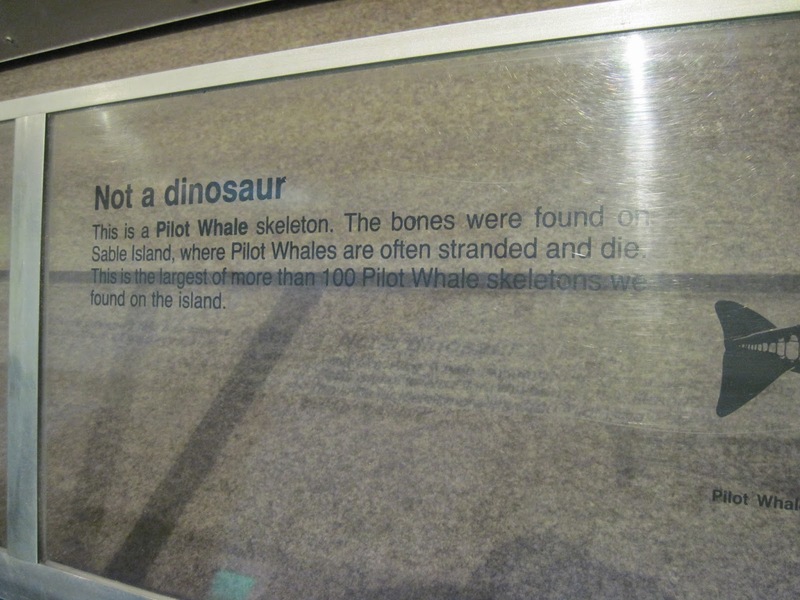 Despite being surrounded by all manner of marine specimens, including a fleshed out model of a sei whale up above, the museum has to explicitly say that a pilot whale is not a dinosaur. In fairness, the museum (sadly!) does not have any dinosaur skeletons, what with Halifax being located on top of the Cambrian-Ordovician Meguma Terrane, and with the Fundy Geological Museum fulfilling the role of the dinosaur-having museum in Nova Scotia. 1. Museum people: put a dinosaur in your museum. There’s no excuse not to have one. 2. Everybody else: many animals have skeletons besides dinosaurs. *Bonus! Sable Island is a super neat place that not many people have heard about outside of the maritime provinces – you can read more about it at their National Park page!